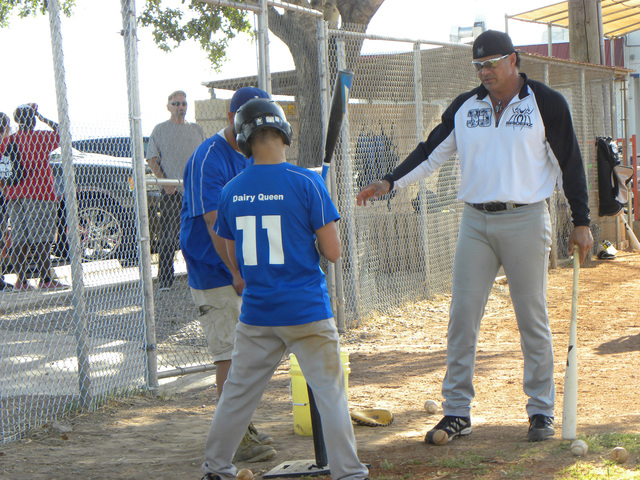 It isn’t every day that a former Major League Baseball player drops in on a Pahrump little league practice. Thanks to one coach’s generous bid at an American Cancer Society silent auction last month that was exactly what happened. 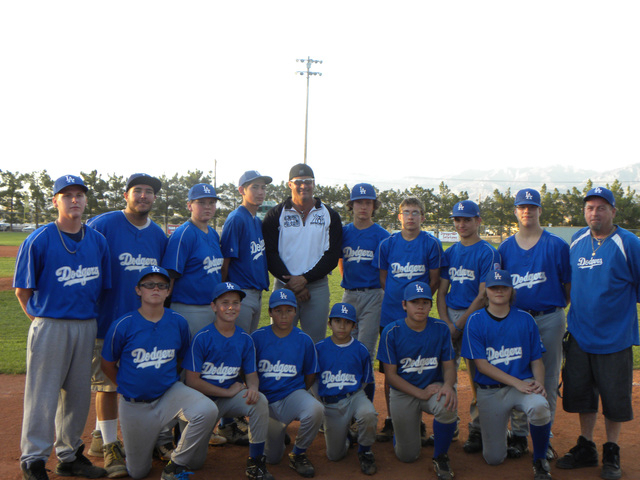 On Friday Jose Canseco attended a junior division little league practice for the Dodgers at Ian Deutch Memorial Park to give the team some pointers. Canseco played for a number of teams during his career in the major leagues, which spanned from 1985 to 2001, including the Oakland Athletics, Texas Rangers, Toronto Blue Jays, Tampa Bay Devil Rays, Boston Red Sox, New York Yankees and Chicago White Sox. Canseco was named Rookie of the Year in 1986, became the first member of the 40/40 club, was named most valuable player in 1988, became a six-time All Star player and won two World Series championships. Canseco donated his time as part of an April 30 benefit event in Las Vegas called Cupcakes vs. Cancer, where he was one of six celebrity judges comparing cupcakes prepared by professional and amateur bakers to raise money for the American Cancer Society. Dodgers Coach Josh Arimura said when he saw that the batting practice with Canseco was one of the items up for bid that evening he thought it would be an excellent opportunity to do something special for the hardworking kids on his team. With a lot of hard work and dedication, however, he said they have been able to improve their record over the course of the season. As of Friday Arimura said the Dodgers were on a four-game winning streak. “Josh basically bought the silent auction item for his little league team. He said he wanted the kids to know he cares and that he wants them to do well. So he thought that this would be a really awesome gift,” Moore added. 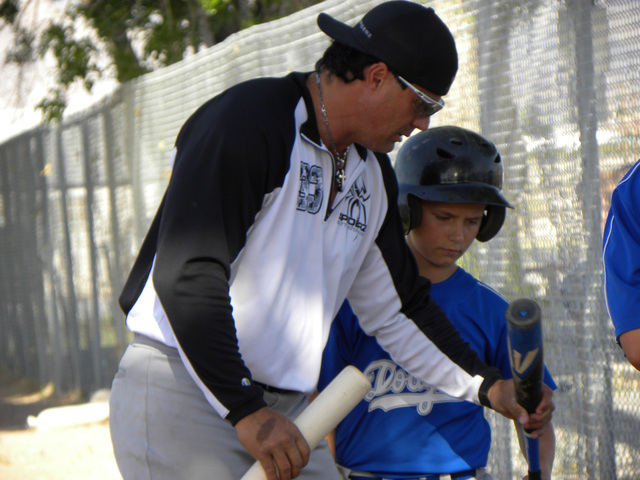 Throughout the practice Canseco worked with the young players on their arm and body positioning as well as their swing, giving them drills to help improve their form. Time wasn’t the only thing Canseco donated to the team last week either. In the middle of the Dodgers practice, after realizing the kids were working with baseballs that were in less than ideal condition, Canseco went to a local store with Moore to purchase new baseballs for the team. In the short amount of time the kids were able to spend with Canseco, Arimura said he could already see a difference in the way they were hitting — something he thought would help them going into the league playoffs that start this week. The American Cancer Society’s annual Relay for Life is scheduled for May 16-17 at Petrack Park. Opening ceremonies will be this Friday at 6 p.m. Cancer survivors are invited to start the festivities with a special survivor lap to honor them and will also be gifted with a free t-shirt and dinner before the start of the event at 4:30 p.m.
For information about the American Cancer Society or to sign up for Relay for Life visit http://www.pahrumprelay.org or call Moore at 702-891-9022.